This seems to be the warehouse for a modern ongoing business located on 5th St. just off of Bollingbrook St., Petersburg, Va. www.manta.com provides, "Spencer Brothers Warehouse is a privately held company in Petersburg, VA. Categorized under Grocery Stores. Current estimates show this company has an annual revenue of less than $500,000 and employs a staff of approximately 1 to 4." 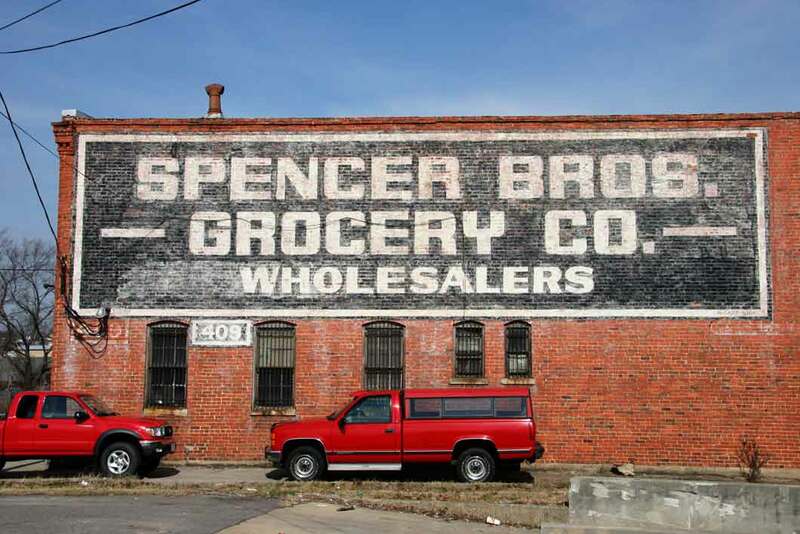 Contact information consists of, "Spencer Brothers Warehouse Phone: (804) 732-5018 Name: Bruce Spencer, Owner Job Title: Owner"
Meanwhile, this building was the site of a much older and venerable predecessor, John A. Gill & Co., who were wholesale grocers located here from 1918 into the 1960s. John A. Gill & Co. began as W. F. Gill & Bro. located at 5 Old St., Petersburg, in 1882. The brothers were William Francis Gill (1843-1925) and John Alexander Gill (1854-1927). Within only a few years (by 1886) the company name had changed to John A. Gill & Bro., and now the brothers were John A. Gill as above and Richard Spencer Gill (1846-1905). Richard S. Gill died in 1905 when this obituary notice appeared in the Baltimore Sun, 17 May 1905, pg. 10, reading, "Petersburg, Va., May 16.- Mr. R. S. Gill died at his home on Franklin street today. He had been in ill health for some months, and yesterday he returned home from Asheville, N. C., where he had been living for the benefit of his health. A native of Chesterfield county, he was 55 years of age. He was a member of the firm of John A. Gill & Bro., wholesale grocers, and was a director of the Virginia National Bank. Mr. Gill was a deacon of the First Baptist Church and a member of A. P. Hill Camp of Confederate Veterans. He is survived by a widow and several children." By 1905 John A. Gill had been joined by his son, John Alexander Gill Jr. (1883-1944). In rapid succession other members of this second generation of Gills joined the company. These were all sons of the John A. Gill, Sr.: Sidney Bishop Gill (1886-1954), Raymond Willis Gill (1890-1960) and Edward Hobson Gill (1898-1981). Another member of this generation was a son-in-law, Richard Milton Cary (1886-1970). All five of these gentlemen registered for the World War I draft in 1918, although some were not yet businessmen. E. Hobson Gill was a student at Virginia Military Institute (class of 1919), and Richard S. Gill was a student at the University of Virginia. John A. Gill, Jr. was vice-president and shipping clerk at John A. Gill & Co. and Sidney B. Gill was secretary at John A. Gill & Co. R. Milton Cary was assistant treasurer at Charles Leonard Hardware. In 1916 R. Milton Cary married Ida Louise Gill (1892-1990), a daughter of John A. Gill Sr. and a sister of the four Gill brothers. "Yesterday morning at 10:30 o'clock in the First Baptist Church the wedding of Miss Ida Louise Gill and Richard Milton Cary was solemnized in the presence of many relatives and friends. The bride is the daughter of Dr. and Mrs. John A. Gill. Her only attendant, as maid of honor, was Miss Luelle Strickland, of Valdosta, Ga. The best man was the groom's brother, Bourdon Cary. ..." (Richmond Times Dispatch, 23 Nov. 1916, pg. 10). In 1957 R. Milton Cary was appointed Petersburg's city auditor, "R. Milton Cary, who will become Petersburg's city auditor and clerk of the Council August 1 ... The new city auditor and Council Clerk is a native of Petersburg where he was born March 25, 1886. He is a graduate of Petersburg High School and holds a diploma in accountancy from LaSalle Extension University. Cary's first job was with a trunk factory, after which he worked for a cigar firm. In 1908 he began his long record as an accountant when he became bookkeeper and credit manager of Charles Leonard Hardware Co., Inc., a position he held until 1918. From 1918 to 1928 he was bookkeeper for the John A. Gill Grocery Co. ..." (Progress-Index 24 July 1957, pg. 11). When John A. Gill & Co. were leaving their Old Street address for 5th St. this ad appeared in the Richmond Times Dispatch, 25 March 1916. In 1960 when Raymond W. Gill died the following appeared in the Progress-Index, 27 May 1960, pg. 12, "Raymond Willis Gill, 70, of 1658 Berkeley Ave., died yesterday as he was leaving Hotel Petersburg after attending the weekly meeting of the Rotary Club. He was president and owner of the John A. Gill Grocery Company; president of First Federal Savings and Loan Association; a director of Petersburg Savings and American Trust Company; member of the Rotary Club; member of First Baptist Church, and a director of the Petersburg Box and Lumber Company. Mr. Gill was a lifelong resident of Petersburg, a son of the late John A. and Ida Bishop Gill. He was educated at Hall and Arrington School, Petersburg, and received his law degree from Richmond College in 1911. Survivors include his wife, Mrs. Mary Land Gill; a daughter, Mrs. J. Newell Williamson; a sister, Mrs. R. Milton Cary; three brothers: E. Hobson Gill and Dr. Fred A. Gill, all of Petersburg, and Dr. W. Wallace Gill, of Richmond, and two grandsons. Funeral services will be conducted tomorrow at 11 a. m. at the grave in Blandford Cemetery." This ad for John A. Gill as the supplier to Hines Food Center in Colonial Heights appeared in the Petersburg Progress-Index in March 1957.